Yugoslavia masses troops at the borders their eastern border. Operation Fallen Hammer prepares to enter its first stage. In the coming weeks scout planes have reported increased fortifications on the Hungarian border. For three days Yugoslavian and Greek bombers force the defenders into submission, when the Yugoslavian 2nd tank division rolls to the line they are not surprised to see the defenders waving the white flag. They are taken as POWs and they continue their advance to the closest city. They shell it for hours. By the end of the day that city is theirs with one downed bomber but, most of the crew survived the hit. 2 injured 1 dead (members of the bomber that was shot down). 2 German and 1 Slovakian (Slovkia was a German protectrate in WWII) divisions invade Hungary. Despite President Risto Ryti's misgivings about German authoritarianism, he believes that he must accept Hitler's offer of an alliance as the only way to ensure the Finnish democracy to continue. However, the Finnish situation is dire. A Soviet force, estimated at around 400,000 men, 3,000 tanks, and multiple wing of bomber craft have begun massing at the Finnish-Soviet border, namely on the Karelian border between Viborg and Leningrad. Armored divisions and mechanized infantry have been spotted on the northern Finnish and Soviet border. In response, Finland has mobilized its entire 250,000 man army, forming a defensive line on the Karelian Isthmus called the Mannerheim Line, constructing concrete bunkers, artillery hardpoints, barbed wire, and mining the no-man's land. Reserves for the line are thin, and the remainder of Finnish forces are sent to defend the northern border. Finland sends a desperate plea for weapons and ammo, as most of Finland's armament is from WWI, and ammo is scarce. Also Finland requests German reinforcements for the northern Finnish border. Stalin, furious over the German attack, and the Finnish move officially declares war on Germany, and Finland when announcing this to the public he takes the peace-treaty they had and rips it up, and says "They are no friends of ours, they are monsters, and we need good, able men to fight them. I encourage all of you to join the red army, join us comrades, you could be the difference between winning, and losing." Stalin also decides to take the soldiers away from the border. And construction of a massive fence with barbed wire, and guard towers is being constructed around the Soviet Union it is expected to be done in a few weeks. Germany seizes the baltic countries of Estonia, Latvia, and Lithuania and mobilizes it's army, which is now roughly 3.1 million men. 1.2 million are located on the Western Front, 1.5 million on the Eastern front, and 100,000 in Northern Germany for the planned invasion of [nation name deleted], 50,000 in North Africa, and 250,000 in other places. 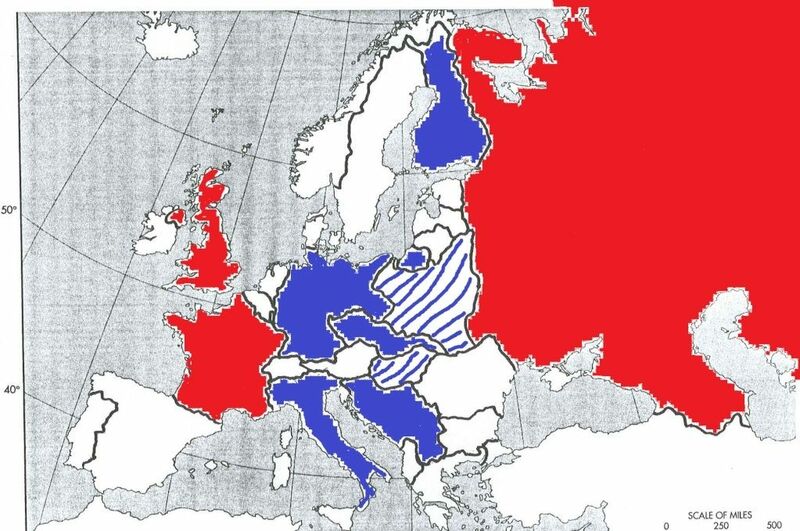 Britain, even though the Russians are Communist, graciously accept the alliance the Russians put forward. As words from Winston Churchill, "We'd ally ourselves with the Devil if Hitler invaded Hell." The worst winter in the past 100 years has hit Europe, turning the Battlelines into a white winter hell. Since planes have been grounded, Artillery shells drop on the German line every day, and suppression has been achieved, albeit with tons of ammunition. The Egyptian line is faltering, but the Egyptians have decided that if their homeland is going to be taken, then they're going to make the Italians pay for it in blood. Guerrilla warfare has been used to take out Italian divisions, and the Italians are powerless to the Egyptian tactics. They were indeed going to make the Italians pay for Egypt dearly. The newly arrived Afrika Korps under Erwin Rommel arrive on January 10th, 1940 to help the Italians. On the Western Front, Artillery continues to fire on the British and French positions, suppressing them. In the South Atlantic, the Admiral Graf Spee continues to hunt and sink British shipping, with 26 ships sunk by the pocket battleship. Germany proposes a Partition of Egypt, Italy gets the mainland on the West of the Suez and Germany gets the Sinai peninsula. The Royal Navy, tired of the pocket battleship's killing spree, has ordered HMS Ark Royal along with a guard of 5 destroyers and 8 submarines to track down the Admiral Graf and sink her with all hands. The ship is loaded down with aircraft and sent to take the ship out. The Admiral Graf Spee passes into the Indian ocean and takes it's 27th victim, the Russian freighter Muscovy. It rendezvous with the u-257, one of the 200 u-boats stalking the Atlantic at any given time, to supply the submarine. In response to the attack on the Russian freighter all freighters will be accompanied by at least 1 Russian navy patrol boats. On January 13th, 1940 German ships began to shell the Norwegian ports of Oslo, Bergen, Trondheim, and Narvik. Soldiers are landed in the ports and by January 25th Norway surrenders. Ok then only on ones deemed "neccesary" by the government. The Soviet Union ammasses 400,000 troops to attack Finland, and 52 tanks. They wait just outside Finalnd until the order is given.